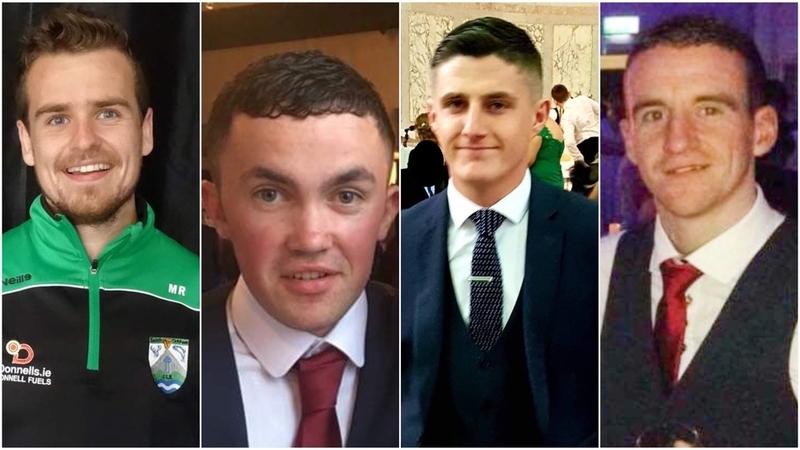 Is lá fíor bhrónach an lá inniu i nGaeltacht Thír Chonaill áit a gcuirfear ceathrar fear óg a maraíodh sa taisme bóthair i nGleann Thualach, Gaoth Dobhair, Oíche Domhnaigh i gCré na Cille. Cuirfear Sean Harkin, 22 bl d'aois as Cill Ulta, Falcarrach i ndiaidh Aifreann 10 a chlog i dTeach Pobail Ghort a Choirce. Cuirfear Micheal O Rabhartaigh 24bl d'aois as Dún Luiche i ndiaidh Aifreann 11.30 i dTeach Pobail Dhún Luiche Cuirfear John Harley as an Cheathrú Canainn, Falcarrach i ndiaidh Aifreann 1 a chlog i dTeach Pobail an Fhalcarraigh agus cuirfear Daniel Scott 23bl d'aois as Bedlam Gort a Choirce i ndiaidh Aifreann 2.30 i dTeach Pobail Ghort a Choirce. Ba iar scoláirí triúr dena fir agus mar gheall ar a mbás, beidh Pobalscoil Chloich Cheann Fhaola druidte inniu ach foscailte go dtí'n mheán lae le comhairle agus sólás a thabhairt do dhuine ar bith a bhfuil tacaíocht a dhíth orthu. Agus beidh Ionad Naomh Fionnán ar an Fhál Charraigh ag cur sú agus ceapairí ar fáil nuair atá na tórraimh uilig thart inniu agus tá fáilte roimh achan duine buaileadh isteach go dtí'n Ionad. Tá breis agus 200 páiste faoi chúram i gcontae Dhún na nGall i láthair na huaire. Sin do réir an t-eolas is deireanaí ón eagraíocht Tusla. 212 páiste atá faoi chúram sa chontae faoi láthair, as an 6,072 páiste sa tír atá faoi chúram. Tá an chuid is mó dena paistí sin i gcúram altramais nó in ionaid cónaitheach. Tá fáil ag 97% dena páistí atá faoi chúram i nDún na nGall ar oibrithe sóisialta. Druidfear tuilleadh Oifigí Poist i nDún na nGall inniu. Druidfear Oifig Poist Ailt a Chorráin, Dhún Fionnachaidh, Mhin an Aoirigh, Bhaile Lífinn agus Cluain Maine ar 5.30pm. Fágfaidh sin go mbeidh 7 gceann déag d'oifigí poist druidte sa Chondae le roinnt míonna, cuid mhaith acu sa Ghaeltacht, ina measc Bun a Leaca, Bun Beag agus Gort a Choirce chomh maith le Ceann Droma agus Ros na Cille i bhFánaid. Beidh Comhdháil Caorach a reáchtáil ag Teagasc in Óstán Clanree Leitir Ceanainn tráthnóna inniu. Is e teideal na Comhdhála no Feabhas a chur ar fheirmeoireacht caorach. Beidh Comhairleoirí agus saineolaithe caorach i láthair le heolas a thabhairt d'fheirmeoirí ar dhóigheanna le cur leis an fheirmeoireacht agus le straitéis a leagaint amach a rachfas chun sochar don tionscail. Dhéanfar plé fosta ag an Chomhdháil ar thodhchaí agus deiseanna an tionscail. Beidh an Comhdháil ag toiseacht ar 6 a chlog. Glacadh d'aon ghuth le rún ón Chomhairleoir Contae Adrian Glackin an tseachtain seo cruinniú práinneach a lorg le Feidhmeannacht na Seirbhísí Sláinte le go gcuirfidh le líon na n-uaireanta a chloig a mbeidh cúramóirí ar fáil do dhaoine atá a dteastaíonn an tseirbhís uathu. Tá laghdú de 2,500 uair a chloig sna huaireanta oibre dona cúramóirí i nDún na nGall ó 2016 le cois go bhfuil 340 duine sa chontae ag fanacht le seirbhís cúram baile ó chúramóirí, a dúirt an Comhairleoir Glackin. Lena chois sin tá daoine ag fanacht bliain iomlán go bhfaighidh siad seirbhís ó chúramóirí, a dúirt sé.